BROKEN ARROW, Okla. — Broken Arrow welcomed nine new police officers in a historic graduation ceremony on Wednesday night. Of those nine officers, almost half were women. The officers visited the shooting range one more time before hitting the streets, where the real test begins. “When I found out there was four of us and there was nine total," Monica Eaton said. "I was pretty stoked, that was almost half and I think it’s awesome." Eaton is one of the four women sworn in and is following in her grandmother’s footsteps. “My grandmother was a sergeant for Clay County, Missouri, which was pretty awesome because that was back in the 70s when women weren’t very prevalent in the law enforcement field," Eaton said. 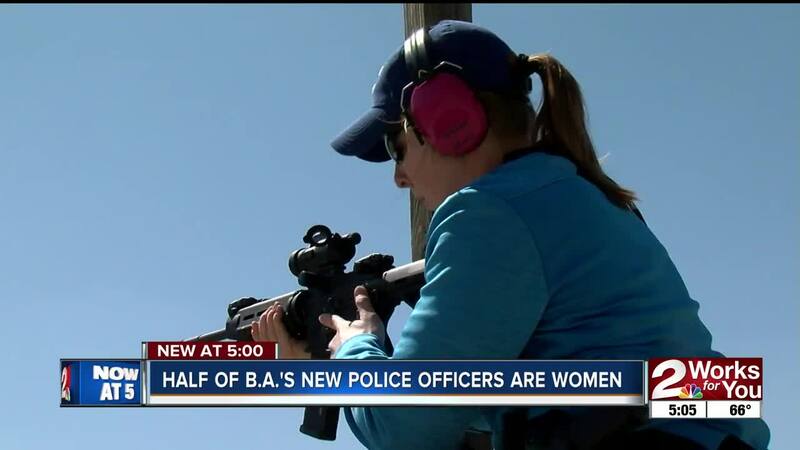 The National Center for Women and policing said women now make up 15 percent of all state, municipal and county police officers. BAPD said this is the most women they have ever graduated in a single class and he hopes the trend continues. “I have been on domestic violence calls where one of the parties doesn’t want to speak to me and they see a female officer, they want to speak to a female officer,” BAPD Officer James Koch said. “I think having more women is a good thing for the community and it makes us more helpful to the women who are not as comfortable being around men," Eaton said. "It presents a new dynamic to be able to relate to more of the public. Eaton said she’s starting to see more support for women in policing from both men and women, and she hopes that support encourages more women to join law enforcement.